Wow you had a great week. I am dying to read all of them. Why does my TBR pile keep getting longer and longer? what fantastic books! tehehe! hope you enjoy! I am lusting after 2 of those 4 books. Great week! Soooo jealous of your copy of Fire! Hope it's good. You had a great book week. With Such amazing books, which one are you going to read first? I heard Fire's really good. :) Enjoy! Eyes Like Stars is brilliant and The Secret Year looks great. Happy reading! Wow, great books! I really want The Secret Year :) Enjoy! Great books, especially The Secret Year and Eyes Like Stars. awesome books this week! I love LAMENT, its so good. Great week! I want to read alot of those books. I have Fire though. Happy reading! wow! Very jealous! 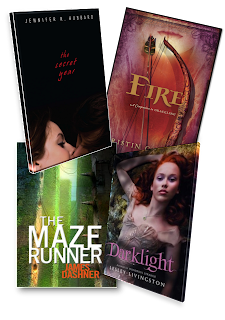 I can't wait to read The Secret Year and Darklight. Lament has been on my wishlist for awhile, but haven't gotten around to reading it yet. Hope you enjoy all your books. How in the world did you get Fire? I'm very jealous. All of these books look really good and I can't wait to read Lament and Eyes Like Stars. Looks like a great week of reading. It's so fun getting books in the mail! Oh...Must read!! all of them!!! and Darklight!! !